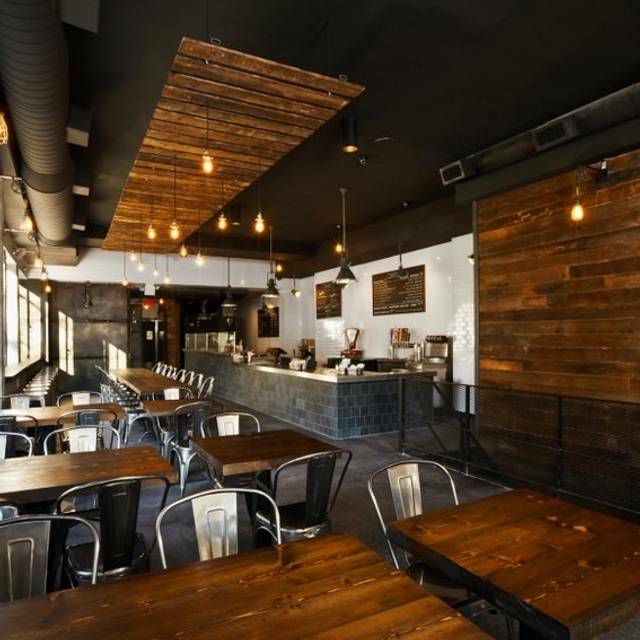 You must make reservations at least 5 minutes in advance of the time at Mighty Quinn's Barbeque. There is ample street parking as well as several parking garages within walking distance of Mighty Quinn"s BBQ. We provide offsite catering for parties of 20 people or more. Details can be found by clicking on the "Catering" tab at mightyquinnsbbq.com/menu. Staffing for larger parties is also available. 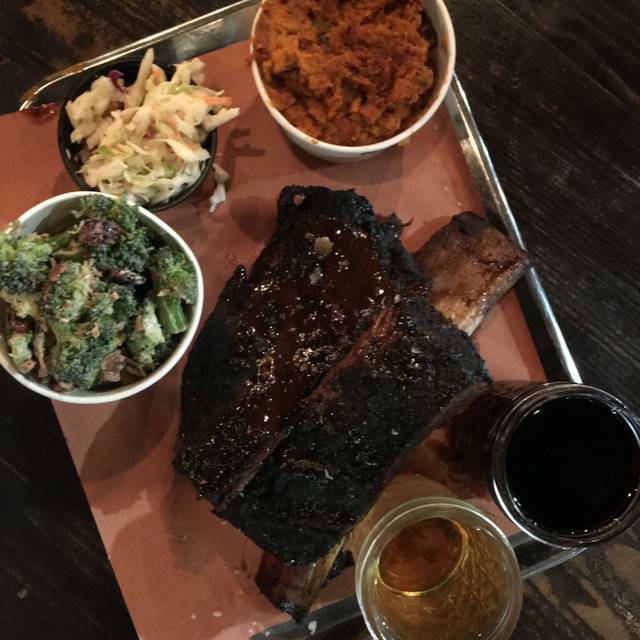 Mighty Quinn's BBQ is the #1 Zagat rated BBQ restaurant in NYC. 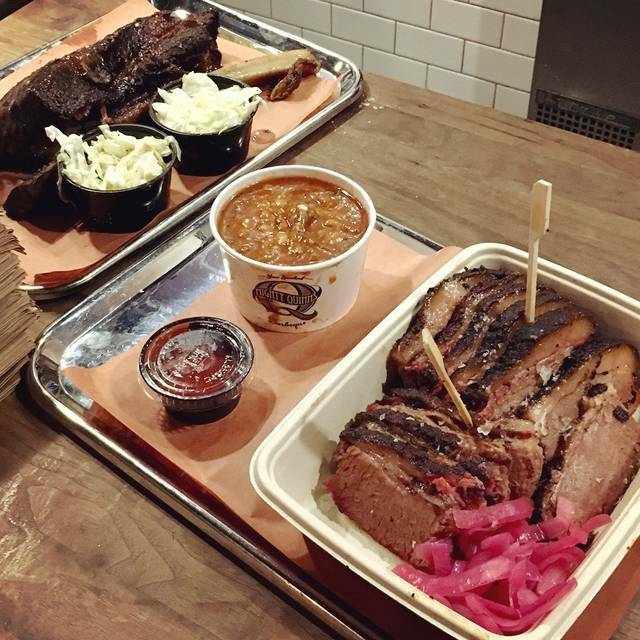 Our traditional slow-smoked American 'Q is served up in a fast casual style service where you order right at the counter. After you watch our cutter slice up your meat, pick your side dishes, get a drink, grab a seat and enjoy! The cooking process begins with the best, all-natural meats and poultry, seasoned with perfect spice blends and then smoked with wood for many, many hours until the perfect harmony of smoke, flavor and time emerges. Good ribs, chicken, fixings and drinks - was fun experience! Great place to grab some good BBQ, beer and sit down to chat with your friends in a simple, casual environment. Quieter than a typical bar or restaurant - which is nice when you want to actually be able to hear your friends. Worst BBQ I've had in a long time/ ever. Very dry to the point of being hard to cut. The sides were decent, but my mac and cheese was cold and congealed. The staff wasn't very friendly either. Just an all around miss for us. We gathered here for my husband’s bday as it was centrally located. The atmosphere was a bit more causal then I thought it would be, but we had a fantastic time. Food was great, staff were really kind and the price for all ten of us was not too bad. We brought a cake and the staff gave us extra plates. Will define go back another time. Its ok a a quick bite spot. Would certainly not recommend to anyone seeking real serious barbecue. Its a chain so consider it like going to McDonalds for a burger vs a steak house for a premium cut angus burger. As for the food, It was very good, tender, full of flavor & a good size portion! If they work on training the staff it would be a much better experience. We were there on a very cold and windy day. Ribs were delicious as were the sides we chose. The restaurant has 2 entrances, one has a temporary exterior door to block the cold, the other opens directly to the street. On this particular very cold and windy day, both entrance/exit doors were operating. Customers usually exited through the unprotected door, sending cold air blasting into the space. We dined in our coats and scarves which lessened our enjoyment quite a bit. Terrible food. Nothing special. People were rude and our waiter seemed to be high. Not sure why you need a reservation for this place. It’s like a chipotle restaurant. No wait staff. Empty tables. Don’t be fooled, this is a fast food place. Our disappointment at our latest visit resulted from the fact that we did not know it had changed since last we dined there. In days of yore it was a full service restaurant with a full bar and table service. Its ambiance could be described as cheerful -- a room full of people enjoying good drinks and barbecue in the casual setting it requires. Now it is a rather sad cafeteria, no table service, and soft drinks, beer, and wine only. The barbecue remains great, but now we know to use it only for take-out. Always a great spot when craving some real BBQ! Love the sweet potatoes and Mac and cheese too! Extremely disappointing. Very loud. The Mac n cheese was so over cooked that it completely lost its form and was one large scoop of tasteless mush. The BBQ was blah at best. I’ve had better bbq in many places. I ordered the “brontosaurus rib” which was a huge beef rib. Although it was tasty it was overly fatty. Beans were good. Very good smoked meat! Very tender and juicy! Ordered the brisket and the bronto-ribs. That is worth it. They have me sample the rack of ribs as a bonus too! This is a fast Food restaurant. Don‘t understand why I am allowed to make reservations here. Excellent, authentic food in a no-frill setting. Very good price for the quality of the food. The only complaint is that the restaurant is not eco-friendly as all food containers and cutleries are plastic. We ordered a full rack of ribs and were told this would take 10 minutes. After 25 minutes I asked when our ribs would be ready. It turned out that they had forgotten our order—the resutaurant was not particularly busy at the time—so we cancelled the order and left. For what it's worth, the baked beans were good and the onion rings were average. Best meat not only in New York but some of the best I’ve ever had! Quick & friendly service. Not to be missed! It was really good, but we were surprised when we arrived. Since I made a reservation, didn't realize it was serve yourself and find a table. It would be similar to Chipotle being on OpenTable. Nice staff, the cashier was especially funny and sweet, great environment and amazing food. We arrived with a table reservation and were told that it is closed community...but we could go to another store. Great BBQ, Great sides. We came from NJ for the Brontosaurus rib, but were disappointed when we were told it would take 30 minutes to prepare. Regardless, the brisket and ribs did not disappoint. Very casual place, and reasonably priced for NYC. Order at the counter. We took a bunch of friends from out of town, looking for an option that would be sort of on a budget - they loved it and we did too. Some awesome bbq here, as advertised. Brontosaurus ribs are huge; share them. And get some burnt ends and pulled pork while you are at it. Did not try the pork ribs this time around. Cole slaw was much more "slaw" than dressing, so that was nice. Sweet potato casserole became dessert, it was that good. One of the best BBQ places I've ever eaten in. Excellent food all around and a nice selection of beers. Highly recommend. Sabor especial muy bueno. Las costillas muy tiernas y fáciles de comer. Cerveza a buen precio. Si te gusta la carne este es tu sitio. We made a reservation and expected a restaurant, however you order your food at the counter, pay for it and take it to a table. Staff could have been nicer and more friendly and welcoming, the food however was to die for. We shared the Brontosaurus rib and it was so good!!! We were only in NY for 3 days and had more dinner reservations, if not, we would have gone back to try some other dishes from the menu! Very surprised that the food was mediocre at best....brisket was cold, at first they were resistant to even warm it in the oven until we asked for our money back...then they brought another order to the table...the ribs were not evenly cooked, there were portions that were raw, I brought them home to complete the cooking process. The spicy hot wings, onion rings and corn fritters were OK. The kale salad had a strange flavor, everyone in my party loves kale, but not this salad it was not good. I love the restaurants vibe and the food was AMAZING!!! I've already recommended the restaurants to family and friends. Not sure why they take reservations, there was no one there to seat us. As Barbeque evolves into the tastebuds of Americans, it is TMQ that is bringing the Nuyo-que flavor to life. The simple atmosphere coupled the robust savory flavor of their recipe and their fair pricing makes it an authentic New York experience that boldens New York’s gastro-scene and enhances its touristic value. Defitnately a must visit if you come to the Big Apple. nous avons fait le déplacement pour rien !